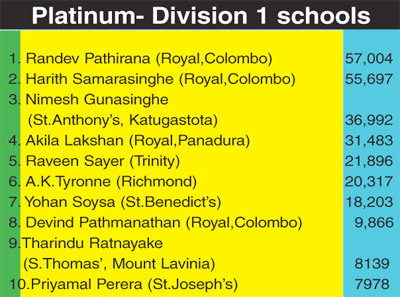 Picking the readers winning prizes... from left: Sarath Mandalawatta (Head of Division Fund Management Dept. 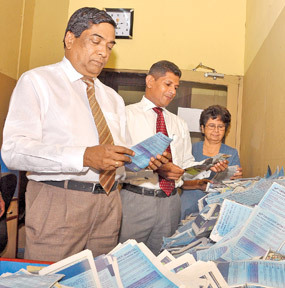 ), Ajith Fernando (Chief Cashier) and Dr. Mrs. Mallikarachchi (Medical Officer, ANCL) picking the winning coupons at the end of count number 15 in the Sunday Observer-Mobitel Most Popular Schoolboy Cricketer Contest 2014. Picture by Susantha Wijegunasekera. 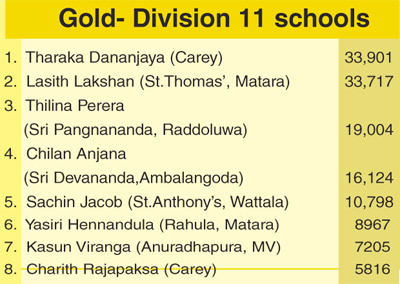 In the ‘Gold’ segment for division 11 schools Tharaka Dananjaya of Carey College took the top spot with 33,901 votes bringing Lasith down Lakshan of St.Thomas’, Matara to second place with a majority of 184 votes. 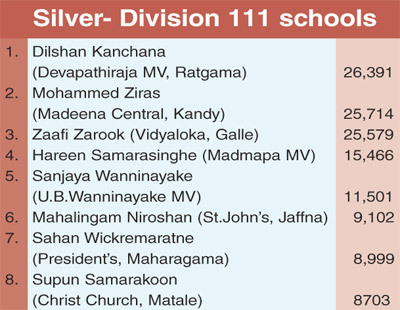 In the ‘Silver’ contest for division 111 schools Mohammed Ziras of madeena MV, Kandy took the second spot polling 25,714 votes pushing the last week winner Zaafi Zarook (25,579) of Vidyaloka, Galle into third place.